Given that the recording of The Separate Ones, the debut full-length release from Eyes Cast Down, took place over seven years of part-time work, it’s no wonder that the finished product comes off as very intimate and personal. Surprisingly, considering its spread-out pedigree, it also manages to feel like a sensible, continuous narrative. Through six tracks, composer Gregg Moorcroft moves his work from warm, straightforward guitar ambient to fever-dream ruminations graced with Sanskrit chant. The journey runs, by turns, from calming to halluncinatory, but keeps the listener engaged throughout. Starting as it does with the quiet ambient structures of “First Day Apart,” it would be easy to dismiss this within the first five minutes as simply that–quiet ambient. As much as I enjoy the rich guitar tones here, it’s when Moorcroft begins imbuing the work with more texture and drama that things get even more interesting. “Rebuild from Memory” retains the sighing notes at first, with Moorcroft rippling their surface with wavering treatments. It’s a very classic sound, broad and calming. “Knife of Karma” glides in on rich waveform pads, then adds a metallic clatter, creating moments of percussion that come and go. Mid-track it turns slightly toward a dissonant feel, like shadows falling across the sound. Sharp guitar notes cleave through the mix. Echoing, chanting vocals from singer Alannah drive “Expanse of Heart.” There’s a wonderful, gut-shaking bass chord that comes and goes throughout the piece, a great counter to the skyward-reaching vocals. And then there is the centerpiece here, “Like A Riven Cloud,” a piece composed of improvised parts, used as a conduit for Moorcroft’s feelings about a friend’s suicide. This is a bared-soul piece of work, extremely vulnerable, with the feel of an unsettled dream. Moorcroft’s wife Dasi recites part of a Sanksrit prayer for protection in the middle of a scattered wash of sounds, and the raw sadness in her voice, at times sounding quite on the verge of tears, cuts straight into you. Violin from Ezra Azmon–whom Moorcroft found busking on the street in Toronto–cries and calls from the distance and adds a fiery anger in spots. At 21 minutes, this is a long time to spend washed over with someone else’s potent emotions, and it’s hard not to come away a little changed from the experience. The disc ends with “Radha’s Tears,” pairing a solo processed guitar with vocals from Dasi. The guitar sounds swirl and resonate, and I find it interesting that the vocals come off as the sharper element here, not interruptive, but at times almost boldly challenging the instrument. Quite honestly, I struggled to find words for this review. I have probably listened to this disc more than 20 times in the past couple of weeks, and it has lost none of its potency for the repetition. While all music is personal at its core, The Separate Ones stands out for the extreme intimacy it conveys and the remarkable depth of effect it carries. It is profoundly intense in its honesty. I highly recommend reading Moorcroft’s extensive background notes on his pieces. The very good news is that while this disc was seven years in the making, Moorcroft says cracking this ice has opened the flow, and there will be several more Eyes Cast Down releases in 2013. This is quite a good thing for ambient music fans. 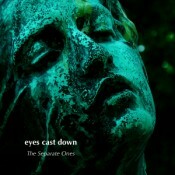 Available the Eyes Cast Down web site. I’ll fix that now, sir!